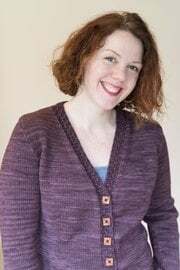 Triangled actually started out life when I decided to knit myself a copy of my "Squared" cardigan design, from my first book "Knit to Flatter". Except, I don't like square necks, so I changed it to a V. And then I decided to make it a little longer. And then added long sleeves. And then, with a cabled check button band and neck trim instead of rolled stockinette. Pretty soon, my version - which I adore, and wear regularly years later - looked nothing like the original. I nicknamed it "Triangled", a riff on Squared's neckline-focused name. Fast-forward, and Triangled is one of the most-loved samples in my infamous sweater sample suitcase. Now, thanks to CustomFit, you can make your own. Triangled is designed with an average sweater length, tapered long sleeves, and an average-width, deep V neckline. 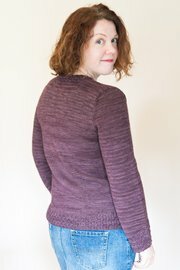 All edges are trimmed with the cabled check pattern, and I'm wearing it with an hourglass relaxed fit in these photos. 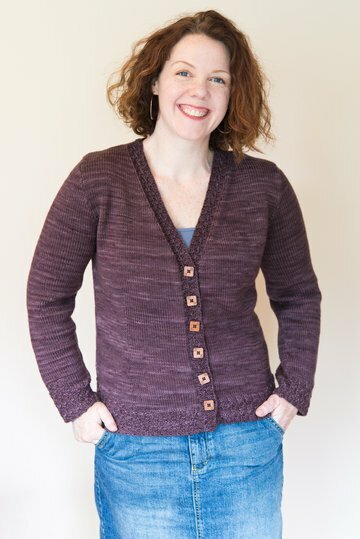 I think it looks great in a subtly-shaded yarn like the Socks that Rock Heavyweight I used here, but the pattern is adaptable and looks great in yarn of all types and sizes. The sample is shown in Socks that Rock Heavyweight in the color "Porcini". My size 42'' cardigan used 3.75 of the 198g hanks of this yarn; assuming the same gauge of 5.5 stitches to the inch, for a standard size 30 (32, 34, 36, 38, 40, 42, 46, 50, 54, 58, 62)" garment you'll need approximately 3 (3, 3, 4, 4, 4, 4, 5, 5, 5, 6, 6) hanks of the sample yarn.